This cheat sheet will show you how to meet every character in Disney World. Some of them are rare or even impossible to find. I list the location that you are likely to find a given character. Be sure to subscribe to Character Locator by clicking the image below to get all the schedules at lightning speeds at the touch of a finger! If you want a fully updated list with schedules, interaction tips, maps and posing ideas, use Character Locator! Subscribe to CharacterLocator.com today to see the full list with complete schedules, interaction tips and posing ideas! Do you think Brer Bear will be in Magic Kingdom this July? Can you put on the whole list? I think they need a Cheshire Cat. Hey Kenny, Flynn Rider now meets with Rapunzel at the Bon Voyage Breakfast as well. He was our favorite!! Yup. It’s listed on http://www.characterlocator.com I haven’t updated this page in a while but Charcter Locator is always correct. This is just an idea but, sometimes I wish that they could replace the Buzz Lightyear meet and greet at Magic Kingdom with Sulley and Mike from Monsters Inc. Since Sulley and Mike are no longer meeting at Hollywood Studios and you can still meet Buzz Lightyear at Hollywood Studios with Woody. I think in my opinion this would be an awesome idea. Just an FYI Ariel is meeting with Eric in her dress at MNSSHP this year instead being in her fins. I’m aware and http://www.characterlocator.com is correct. This list isn’t the first priority for me. That’s cool. Do you happen to know if star wars weekends will continue anymore? Do you know if the Jedi characters (namely Shaak Ti) will be returning for meet and greets in some way? Do all meet greets categories listed above do autographs? You won’t see him anytime soon. Do you have to subscribe in order to chat with you in chat room? Just curious… Is Moana going to be arriving to WDW soon? Any news on Marie returning…… anywhere??? Do you have this list in PDF so i can print it out for my daughter to check off? I know atta does not do meet and greets all the time but when she does where does she meet and who doe she meet with usually? Unfortunate but understandable. Thanks much for the help! I’m so sad to see mike and sully are no longer in Hollywood studios. Is there anywhere else to meet them? Kenny, is Disney world ever going to do Long Lost Friends Week again? I went to Disney for my 24th birthday in September 2016 and I got to meet Marie in the Town Square when the park was opening. She was out there for an hour. She does not meet in Town Square any longer. Minnie takes that hour. Wow! I was looking at the list of “hard to meet” characters and realized the last time we went to Disney (2010) we were able to meet 5 of those and have pictures taken. I’m so glad we had the chance!! Yes, characters change frequently. Some who used to meet daily are no longer available at all. Is there a place to meet Remy from Ratatouille? My daughter loves him and we are going in July. Was hoping she could meet him. Is, or has there ever been, Quasimodo or Esmeralda for meet and greats?? They’re my #1s!! I noticed that jedi mickey, princess minnie, stormtrooper donald and darth goofy are not on the list. was that only a one time thing? Please say they are regulars. Do you have a simple list that can be printed out, which includes the characters and where they are located? I have tried multiple “clicks” on your blogs, etc. and have not been able to find one. I am a single mom taking four kids (one with ASD) to Disney in a February and this would be very helpful. It’s Halloween and Anna and Elsa aren’t meeting at the Magic Kingdom. They only meet in Epcot. All listings on http://www.characterlocator.com along with meet times are correct as well. I’ve wanted to meet Clarice and Roger Rabbitforever. Is there any way to figure out when an unlikely-to-meet character may appear in the park? Those are beyond rare at Walt Disney World. We haven’t seen them in years. Your best bets are Character Palooza and Epcot Training. Does Marie from the Aristocats appear anywhere? My daughter would love to see her on our upcoming trip! Marie does do meets in France in Epcot! Is there a master list of all the characters at Disney World who do autographs? I want to make a book for my daughter. http://www.characterlocator.com mentions when a character does or does not autograph. I joined and I see the master character list. but it doesn’t say for everyone whether or not they do an autograph. is there another list that I am missing? When you view a character’s info in http://www.characterlocator.com it states whether that character signs, has fp etc. It doesn’t say for a lot of them. One main question. Does the beast sign? I have read yes, I have read no, I have read belle signs for him. It doesn’t say. I list of the the autographs you could collect would be a great addition to this wonderful site! Quick question. Do you know if maleificent appears often or just around Halloween? My daughter was wondering if Olaf signed? Yes, draws a snowman. If you click on Hollywood Studios, you’ll find that detail. Good to see Aurora is back in Epcot. Can you even get a picture with Sully &/or Mike anymore at Disney World? Kenny, will there be another Long Lost Friends Week again? Rabbit is one of the harder characters I don’t have yet, and I would love to add The Big Bad Wolf and the Three Little Pigs to my character list. Disney World is 35 years old and I think they should do another Long Lost Friends Week, and other big Disney stuff too. Does the Beast appear every night at Dinner in Be Our Guest? Is there a way I can print the list to take it with me to the parks?? Why not just subscribe to Character Locator and gete the schedules as well? I’m a local and my daughter has already met several of them, I was more or less trying to create a cross off sheet of who she needed to meet yet. You made a great list!! We’re at Disney at least once, sometimes twice a week. I’m going to Disney this summer, and I plan on meeting Peter Pan. If I showed him a picture, would he recreate that picture with me? I may be wrong, but doesn’t Jiminy as of 2015 come out at Rafiki’s Planet Watch sometimes? Do you happen to know anything on the characters at Disneyland? If not do you know where I could get some insight? I want to meet both Nick Wilde and Judy Hopps together. I heard that starts soon. Kenny; you are missing a character in your list. Someone just sent me a pic of a character walking around Magic Kingdom today and nobody can figure out who it is, was hoping maybe you had an idea. How can I send you a picture? Probably not a regular meet and greet, but feel free to email me the photo and I’ll identify it for you. One day actor for the Grand Opening of Stitch’s Great Escape. Never made any meet and greets. Hello! I see that the star wars characters say that they do not meet anymore. I have unintentionally (but I am happy about it) booked my trip during a Star Wars Marathon Weekend. Will these characters meet during the weekend or are they done meeting for good? Some will appear for the marathon course, but only Kylo, Chewbacca, Stormtroopers and Jawas appear daily. Most only appeared for Star Wars Weekends in the past. Ok, thank you so much! Love your site! Why are all the Disney fairies listed as “unlikely to meet”? Are they not in Pixie Hollow anymore? Mad Hatter has replaced White Rabbit – with Alice at the Mad Tea Party. They could be race pictures. We saw lots of great characters at the princess half this year. Thank so much for taking the time to share all this information, it is so helpful! I see Tinkerbell’s fairy friends all say highly unlikely to meet, but is there any possibility they will be at the MNSSHP this year? If so, are the same characters always in attendance each night? Thank you! Looking at the list, I got lucky to see most of the highly unlikely to see. We have seen Chicken Little, Flik, Friar Tuck, Clarice, Prince John, Kenai and Koda, Herbie the Lovebug, JoJo, and Kim Possible. This was all on the same vacation, but has been some years back. I thought Hiro and Baymax were at Hollywood Studios, any idea on where or when we can find them??? Are the seven dwarfs still available for meet and greets? Only during parties as listed here. How about Pete, the oldest continuing Disney character? Hey Kenny, I wanted to say that Mulan was at Cinderella’s Royal Table instead of Ariel at lunch on June 18th. The other characters were Sleeping Beauty, Snow White, Cinderella (downstairs), and Jasmine. Substitutions do happen from time to time. Thank you so much for this list but I would like to say that you can see Remy and Emile. Remy can be found in France and at the Restaraunt Tour de France but you have to make a reservation. The time I saw Remy Emile was with him. If your life goal is to see them then go on the Disney Fantasy. I saw both of them twice there. All I would like to say is Remy and Emile can be found. Remy and Emile do NOT meet in Walt Disney World in any form and there’s no Tour de France restaurant either. I met Remy at Disneyland Paris though. Thanks, Kenny! Do you know if John Smith, Prince Eric, Hercules, and Phoebus have been out for training meets or something lately? Been seeing a lot of photos of them with guests on my TL and hoping to get lucky and run into one of them this Christmas. PS thanks so much for creating this site! Hi Kenny! I will be at WDW for the marathon in January and was wondering if guests who aren’t running the marathon can meet characters such as John Smith and Prince Eric who only show up for race events? Will be supporting a runner but not running myself and would LOVE to meet these characters. Thanks! Hi Kenny! Im going to Disneyworld this July, is there any possibilities that I can meet Robin Hood? I know its a really rare character, but wanted to know. Thank you! Do you by any chance know how long they’ll stay there for? I ended up postponing to June, and I’ll be devastated if they aren’t there then. Hey, do Brer Rabbit, Brer Bear and Brer Fox still show up at Disney World in Florida? We’re going in mid June. All characters and possible locations are listed here. Are Hiro and Baymax still there? Gonna go there in a few days, really hoping to see them…. I have a subscription. Yesterday I was able to access characterlocator.com. Sometime last night it quit working. The character list flashes and then goes back to the black box screen. Still, today, it doesn’t work and I can’t access it on either the computer or on my phone. Is this something on your end or mine? My trip begins this weekend and I would like to use it. Thank you. We are working to restore service asap. Sorry for your inconvenience. Kenny, Peter Pan was removed from the listed meet and greets at disney world. Does this mean one cannot interact with him or get his autograph other than the pirates and pals fireworks or does that just mean his schedual is very variable so they don’t put it on the website? He is like the only character that was like a must meet even higher then Mickey Mouse. Do you know if the old hag evil queen signs autographs differently than the main evil queen? Not sure. I didn’t request autograph last year. Kenny, are PhotoPass/MemoryMaker photographers always at scheduled meet-and-greets? Usually at most. Never at any Mary Poppins meet. They did not appear for 2015. I am trying to make autograph cards for the DISboard for every character that will sign/stamp/leave a mark of some sort in an autograph book, even if they only sign once a year. Do the Star Wars characters mentioned above sign? Star Wars characters do sign, but it would be a lot easier to just post a link to the characters that don’t sign. Thank you! Aww I wanted to see them. Thanks again! Hi Kenny! So I am likely to go to Disney World this year (was supposed to go to last year but postponed at the last minute) and I’d like to know if the Storybook Circus Giggle Gang still appears in Fantasyland. Also, when is the best time in the day to go for Enchanted Tales with Belle, Ariel’s Grotto and The Hall of Presidents? Did Wreck-It Ralph and Vanellope get pushed out by Hiro and Baymax? Is there anywhere you can expect, or get a shot at meeting the two of them still? I hear Flynn Rider makes random appearances at Epcot. I haven’t caught him yet but I heard from last couple months he appeared there. I’m just not sure when or where or what time, but I heard been there few times. I just wish I be there at right time to catch him. Last time I saw him was at 24hr event early this year. I hope I get to see him again. Anyways there are few random characters I spot here and there, but you got to be there at right time and place. However I do keep my eyes open at all times. I know I finally saw Ratclifee in which I never met before and also I saw Max (goofy son) recently. I also seen some other characters during dance party at Animal Kingdom a couple times that I haven’t seen or did see but haven’t for while. Hello – you posted that Terance appears until Nov 4th & is replaced by Periwinkle on Nov 5th. Is this current for this Nov – 2014? That’s old. I’ll update it. Hi! Great site! Any updates for 2014 about The Little Einsteins? Or even the new show, Sheriff Callie’s Wild West? Thank you! Do you know where we may find these characters? Does Dopey still train at epcot or makes rare appearences at magic kingdom? Hi Kenny. I love the dwarfs. Now that 7DMT has been announced, have you heard of any rumors of them making regular meets? Or will they only be available at the parties still? That’s great that Capt Jack was willing to sign and that you met Clarabelle at the Hoedown too! Are you sure these characters don’t appear at all if so then please tell me where! Do you know if you can get a frequency key for these characters? Nope. There’s details on each page and no way to know when an unscheduled meet will occur. Just enjoy the ones you find. I LOVE YOUR SITE!!!! we are going for the first time in June and I wanted to make my own autograph book. you page was most helpful. Hello. I just found this sit. I am a BIG fan of the Mad Hatter and I seen that you have put a list of where all he can be found. Mickey’s Halloween Party is on that list, can you tell me if it is the same Hatter/Man from the “move it shake it celebrate it street party”? And if so how do you meet him? You see I have been going to WDW since my birthday, I have seen that party so many times that i can tell you how it all go moves and all. When I was watching the Disney characters make there way to where it comes to a stop. I looked up and seen the Hatter pulling at his jumper, he then blow me a kiss. Cool huh? As the day came to an end the show made its way to where we were sitting at. On my left my day and on my right my mom, both telling me to look up to see the Hatter with his tough out and pointing at me. As the weeks passed I kept seeing him and him me. Mr. Hatter will stand and posses for me talk to me and even tell me how beautiful I am. On that day I got to meet him but sadly my photos all came out as negatives, it was less than five secants to show time. But the real reason I would love to see him again is that on my last trip the pared was consoled due to bad weather. But a stand in one came down and that one as so darling to see. When the trolley whit the Hatter made its way to where I was standing the Hatter was looking at Pluto the dog. When in a split secants he saw me and pulled himself up to the side of the bus and gave me a sincerely I know you smile. Well later that same day “the move it shake it celebrate it street party” went on as planned. When out of the blue the Hatter came to far right side of the float, stood there until I looked up when he pointed right at me and told me that he LOVES me. Yep you seen and read that line right. When I told this to a CM she told me “that I had my one in a life time magical moment and that was It.” and that I cannot on whim just ask to meet him. So you see if I can meet him out and about then that will help me a bunch. Do you know if the Hatter at the Mickey’s not so scary Halloween party is the same man? I might have another way to meet him, but to meet him out and about would be nieces too. Especially at the Mickey’s not so scary Halloween party as this will be my first time going. Thank you. Mad Hatter has appeared at MNSSHP the last few years. However, you’re best shot any time of the year is 1900 Park Fare Breakfast. I checked the tips on Jake’s app page, but it only gives the times, no actual tips, am I missing something? And since I am new to the app, how does it notify about schedule changes, does it simply update times on the character’s page? I just downloaded your app last night. Our trip is planned for April 2014. My kids met Jake at Disney Jr Play & Dine in the Spring of 2012. Before reading above about the Animation Courtyard, I had no idea Jake could be met outside of the character meal and the Dance Party! How long has he been there? Well, more importantly, is he always there, like every day? And what are the hours he is actually out? I see the range of “09:30 AM – 04:30 PM”, but is he out the whole time, for the whole day? Or on & off? I would love some tips on meeting up with Jake! Thanks!! Does Liverlips appear randomly at Epcot Training or at Frontierland Hoedown? Does Rabbit from Winnie the Pooh still appear randomly at the UK at Epcot,and do the Tweedles still appear at Character Palooza? Do Flik,Atta,Mushu,Miss Bunny and Thumper show up at the Dinoland dance party sometimes? Hi Kenny! Where will you post the picture? Thank you! Hi! This may sound like a silly question, but do you know what style dress Cinderella is wearing at her castle? can you give me a list of characters that sign or stamp? I would have really liked a key as to what all the acronyms are. I’ve never been to Disney and we’re going in August, so I’m a little confused as to what characters we’ll be able to find and ones we won’t because the acronyms. Does or will Olaf appear anywhere for meet and greets? Hi Kenny – great site and great app! I haven’t been to WDW since 2011 (and 2008 before that) and we saw Timon, Pumba and Flik at AK. Your list says they are now unlikely to be seen. Is there any small chance they may be seen in the summer (2014), do you know? You saw Pumbaa? Given current rotations, it is HIGHLY unlikely to meet Flik. You can see Timon in the Festival of the Lion King show this summer and he sometimes appears for parades but hasn’t offered meet and greets for some time now. Rafiki is still available, but Timon just doesn’t make appearances right now. There may be an EXTREMELY small chance of a training meet unless Disney changes the character rotations. They have been gone for quite a while. June is the only one left and June will remain at Hollywood and Vine character breakfast and lunch until January 25, then be retired from rotation. Who’s the most recent character to leave the parks? I think it would be Daisy Duck leaving Epcot. In your opinion, who’s the best current character? Will doc mcstuffins be there by November? Links for each park are at the top of this page with schedules. You can also click “Characters” and it drops down. Hi Kenny! Any guess as to when Terrence flies into Pixie Hollow? My daughter loves the Evil Queen from Snow White. Do you know if & where she can be seen? You overlooked Vidia on the bottom of the list. Terance should arrive in Fall and Periwinkle in winter. Rosetta in spring. Hi there! This is THE best character list I have ever seen!!! I thought I would mention that I was at WDW two weeks ago and on July 4th, we took a pic with Pinnichio at Hollywood Studios while waiting in line to go into The Great Movie Ride! That was so cool! He was out for maybe 10 minutes??? I wonder what that was all about??? Thanks Becca! I work hard to keep it as current as possible. Sounds like a surprise meet and a great treat for your vacation! This is a great list!!! I was just wondering if any of the princesses would have their men with them? If so which ones and where?? Nope, only for the parties. That is a complete list of regular characters. Check out the rare and uncommon pages for those that may make surprise meets. Just wanted to let you know that Perry the Platypus apparently appeared at Hollywood Studios this summer (first day of summer). While I didn’t see him, here’s a connection to the photo. A cast member tipped me off. Was he out for public? That’s a media post for a star meet and greet. Any news on a Sophia m&g were going in July? Fantastic site can’t wait to interact with the characters. How often are changes to this made? We will be there August 17th – August 24th. Would I be safe to print this out and start making plans now or would you recommended that I come back closer to our trip? And if I should wait, when would be a good time to check back in? Thanks! As often as they occur. Date is always updated when changes are made. I may have missed this but what princesses are at the new princess meet and greet in new fantasyland?? Great list!! Do you know how long WIRalph and Banellope will be at HS? We go at the end of June and hoping they will still be there! Extremely accurate and update dates are on each schedule. Schedules change seasonally. My son loves Pete from Mickey Mouse Clubhouse. We will be there this year from 12/1 through 12/10 is there any where we can actually meet Pete in character? Unfortunately, Pete is not meetable and there’s no plans to change. Is Pete at least apart of the disney junior stage show? hey i just came across your site! 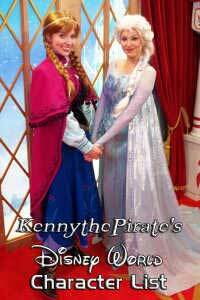 we have a trip planned late may for our 4 yr old grandaughter who is quite obsessed with the princesses! ive jotted down the meeting places- thank you sooo sooo much! Hi Kenny! Heading back to the world in April, currently working on another set of autograph cards. Can you offer any information of whose is appearing at Characterpalooza? We won’t know for sure until March 10, but the ones from last year are on the side menu. Are the odds of seeing Indiana Jones/Marion very high? We’ve never seen them so I’d like to add their autographs to our collections in June. Indy often meets after the Stunt Show. Stay around until everyone has left. You’ll see him on the bottom right. I’ve only had Marion stay around once, but you might ask if she will. any idea if/where there is a place to meet the mice from Cinderella? We are going the Disney World in 2 weeks and that is who my 2 year old daughter wants to see most! None of the 4 mice from Cinderella offer meets at Disney World. Last time I saw the girl mice was a surprise visit at the halloween party and the boys have been out in forever. Any word on the rehab at Disney Junior? I think they were supposed to reopen today. Wondering if Sofia and Doc are doing meet and greets by there now. Thanks for this fantastic list! Great job. Last year during my birthday trip first week of March, Darth Vader was out with Storm troopers at the HS Star Tours ride, posing for pics and autographs. I got a great pic, and had a fun character interaction. The Storm troopers also signed autographs. Pinocchio was out in MK near the Barbershop in Town Square. I love meeting characters, especially ones you aren’t expecting! I don’t understand the question. All the characters on this list are live. Some are face, some are fur, none are cut outs and none are animatronic. Oh, okay! Awesome! I guess some of the pictures made me think they were statue-type things. what is the name of caracther spot? Where is Clarice,Cruella de vil,Flyn,Giselle,Hades,Jane,Kim possible,Wandy et yellow rabit. None of those offer regular meets. Yellow Rabbit, Tweedledee and Tweedledum were all out for meet and greats at Magic Kingdom today, February 3rd. Sounds like a fun day at the Magic Kingdom! Where is grand florisian in disneyland ? in disneyland what is the best restaurent for célébrate birthday? Who princesse is in de cinderella royal table restaurent? Who princesse in cinderella royal table ? the merida mother’s is there or not? the all fairy costumes is in the magic kimdom park or not ? Hi Kenny – we are heading to DW in a week. It will be our first trip with our 4 year old and she is beyond excited. 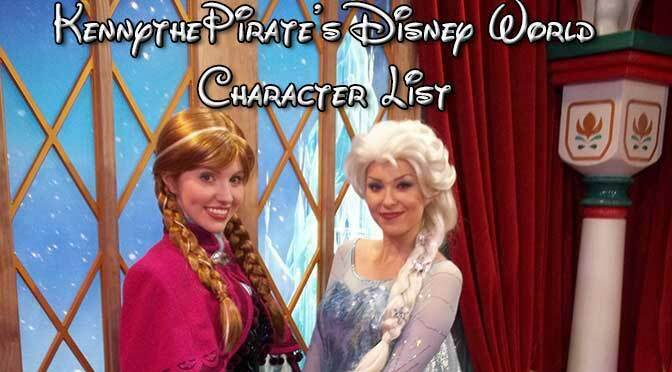 Do you know if they will have Doc McStuffins or Sofia the First out and about? I know that they are set to appear in Disney Jr. Live – but that opens up the week after we are there. Wasn’t sure if they would have the characters out prior to that. Thanks! No those characters aren’t out now and Sophia may begin late fall. No word on Doc. Is there any way to meet Mickey in his wizard outfit from Fantasia? Is Beast still meeting at Be Our Guest at dinner after you eat? Any more news on when/if in the Spring Sofia the First and Doc McStuffins will be at Hollywood and Vine? Yes, Beast is right above Belle in the list. Sophia may arrive late spring. Heard nothing on Doc. In the last 24 hours, 2 different people (who I don’t personally know) posted pictures to Instagram with Chip from Beauty and the Beast from WDW. Both were standing in front of a low stone wall with pink and red flowers behind them. Any ideas on if this was a one time thing or will this be a regular meet and greet? Nevermind! I saw your other link with the unexpected meet and greet of these Beauty and the Beast characters. Bolt stopped offering regularly scheduled meets a long time ago. You might find him at Character Palooza or in Epcot for surprise meets. Yes, you can only meet Beast for Dinner at Be Our Guest after you eat. No word on Doc. Sophia is supposed to begin sometime in the spring. We are going to Disney during Christmas week. I was wondering if you could give me some directions for meeting Pocahontas – my youngest favorite princess (weird huh?). We went during this time last year and she was not at Camp Minnie/Mickey and we could not find her at Rafiki’s planet watch. Any ideas? Click on Pocahontas to see her location. She’s only in Camp now. Hi Kenny, does Maxi appear anywhere please (goofy’s son). We are at WDW from 13th December to 27th December and have MVMCP tickets. oh i see it now! haha sorry! No, she’s right there on the list underneath Mater in alphabetical order. Hi Kenny! Thank you for such great info! Just wanted to know where I can find Peter Pan? You have him listed at both adventureland and philharmonic. Thanks! Oh, and Be Our Guest is NOT going to be a character meet and great. Fine dining, no characters. I know plenty cast who work there, this is a verified and true fact. Good to hear the Meeko gets some love! Thanks. I updated location on ak page but forgot master list. Doing a last minute as in 13 days to get everything together tirip and was wondering if you could advise what characters have been sighted recently during characterpalooza? Also when is wreck it ralph and vanellope suppose to start thier meet and greet? got your reply on the other forum. Thanks again!! I noticed that Beast isn’t on the list any longer. I could have sworn he was there a few weeks ago…Is he no longer meeting in France with Belle? Any rumors about him being added to Fantasyland when the expansion opens? Going next year…. Fingers crossed doc mcstuffins is there. She is my 4 year olds idol! She tells me she is going to be a doctor in Africa and china now that travels to help sick little kids. I feel doc can be very inspirational for their futures. I just found this site on the last day at Disney world. I love it and can not wait to use it when we go back hopefully next year. This was our first trip and my girls got autographs and picture with 43 different characters. Just wanted to share that this past weds. In Tinkerbell’s Nook we got to meet Periwinkle her sister from the new movie. Brer Rabbits can be seen during the ho-downs in frontier land, Pictures can happen,. autographs very very unlikely. Yes, the Brers come out to dance. I’ve gotten a photo with Brer Bear, but Rabbit keeps running away. The Master list reflects ONLY the characters regular scheduled meets though. I don’t track the randoms or dance characters for schedules. I should add Hoedown in general to the Magic Kingdom list though. Currently only have it on showtimes. Sorry, I thought I had replied to that question via email. I guess it didn’t post. Thanks to anonymous for answering. Thank to both…yo did reply Kenny….I also posted question in “Why Characters” section. I do have another question…In reading on another disney sight, they stated brer bear and brer rabbit can be seen in Animal Kingdom, at Camp Minnie Mickey. This is the first I had seen of that. Is that true? Once again love the sight, visit daily!!!!!! Hi Kenny! Is there still no Doc McStuffins rumors? No, haven’t heard any buzz on Doc still. At the hoe down…Can you do pics or autographs with Brer Rabbit??? ok i wont be there for the christmas party but will be there from dec25-31 how much different as the meetings and are there ones that arent normal on the schedual but will be there because of being christmas time? There are a number of special characters that appear for the party. No special characters appear at the Magic Kingdom during that week unless they are training meets. I think my two year old has stumped me. Is there anywhere to meet Flora, Fauna and Merryweather from Sleeping Beauty?! Doesn’t look like it but just wanted to double check. Thanks! Chrystal – last time I saw Peter, he was very close to his ride. (It is relatively close to Philharmagic. My favorite thing about the picture was the hidden Tinkerbell painted in the window! I didn’t notice her there when I was talking to Peter, but I love how it looks like she is flying actual size over Peter’s shoulder in the picture. What attention to every tiny, magical detail! Peter was moved from Philharmagic when they began using the window for Sorcerers game. He is located near the Adventureland bridge now. First of all, your site is fantastic. But I have a question. I am desperate to meet Peter Pan. The master list says he is by Philharmagic. But the MK list says he is by the Advantureland bridge. Where will he be? Yes do you know if Dopey will ever be seen again outside of parties?! Tough to answer what they might do in the future. He sometimes makes surprise appearances during training seasons. Hey I only like characters that are masked and was wondering if new fantasy land will have dopey or something if u don’t know please tell me @ least who u think will be there. Thanks! I have seen recent video of Gaston coming out and meeting with Belle in Epcot. I am assuming this is character training for the Fantasyland expansion with Gaston’s Tavern. Have you heard anything about his appearances? Gaston sometimes does training meets, but other than Mnsshp, he doesn’t offer regular meet and greets and won’t in the new fantasyland. Belle will go back to offering storytime in her cottage, but Gaston will not be a character. First of all, THANK YOU for all of this information! You are truly a lifesaver for many of us. :) Here is a question for you. I have a son who loves Wall-E. I haven’t seen anything mentioned about Wall-E and anything involving Disney World. Just making sure we aren’t missing anything. Thanks for your help!! I am in the process of making an autograph book. I know we can still see all the Princesses but my questions surrounds the PRINCES to include. I know there is no Flynn Rider, and I know for sure there is Naveen, but what about any other princes? You can meet Naveen in afternoons with Tiana in Magic Kingdom. Beast is in France, sometimes with and sometimes without Belle, depends on schedule. .Aladdin meets with Jasmine in MK and EP. Prince Eric is with Ariel in MK. Thanks for the update Kenny! Keeping fingers crossed to see TImon at character palooza. Always loved his reaction to his very own autograph card. Hope Disney changes ways and starts adding more meet and greets instead of less. Will be putting my autograph books together this week before the kids get out of school. Sorry to say that Meeko, Timon, Miss Bunny and Thumper are no longer on the schedules. You might find Meeko and Timon at Character Palooza though. Seems my question was lost before and unanswered. Please tell me what is Character Palooza?? Checking back in, any upcoming character changes? Tina, I recently updated the schedules. Only rumor is Baloo moving to camp. I guess this guy is only a true “character” in my 5 year old son’s eyes, but do you have information about the remote control talking trashcan (named “Push” I think) that is sometimes found in MK & Epcot? We never had an encounter with it last year and it was the only thing left on my son’s must-see list! Have you heard about the possibility of Doc McStuffins being a character meet and greet (I know she’s new, but Jake was out in a mtter of months)? Haven’t heard any rumors about Doc. Seems like he would be a good replacement for Handy Manny though. What is this Character Palooza you talk about that happens at DIsney Studios? Thanks!!! This is a great list. I nice addition would be a note to whether there is a photopass photagrapher at each of these locations. I love getting as many full family photos with the characters but not all characters have photopass photagrathers with them. It’s a great idea, but sometimes the photopass guy doesn’t show up for the meet. I can add the ones that we think MIGHT be there though. Do you know if the only place to meet Captain Hook and Smee is the Pirates and Pals fireworks cruise? Hook and Smee can often be found at Character Palooza in Hollywood Studios, but have no scheduled meets. Thanks Kenny, You have an awesome site! Lilo – is she know longer meeting in AK? Merida – to begin appearing in MK ?? Lilo was retired from AK. Merida is set to begin meets in MK middle to late May. Jake took LIttle Einsteins place in Hollywood Studios. Many of those are only available randomly at Character Palooza at Studios. Agent P – has never offered regular meets only a couple of special events. Br’er Bear – might find the Br’ers at Camp Minnie Mickey in the morning. Lately the Fairies at Tink’s Nook are: Tink & Terrance or Vidia. I only list the characters that have actual schedules on my site to help people plan. The others may show up as a surprise! Kenny, have heard that Mushu has appeared at China in Epcot on the day of Chinese’s new years over the past few years. He has been reported out for that day most years. It’s in Februray this year. They should do a Chinese New Year week with the new celebration and bring out all the Mulan characters. Going in June and putting together an autograph book. Any rumored changes coming up in the near future? Kenny- your blog rocks! Thank you so much for the character list. It is a life saver. I’m making my son and two nieces their own Disney autograph books. This has helped so much. Thank you for making these lists!! Isn’t Agent Oso and June at Hollywood & Vine only at B&L? I’m booking now and it is showing the Fantasmic! event at dinner. Is there really Characters at dinner. If I get Characters and Fantasmic I’d be so excited. ^ from Heather….i forgot to leave my name! You might find Capt Hook & Smee at Character Palooza in HS, but that’s not guaranteed. Yellow Rabbit sometimes appears at Crystal Palace too. Nevermind, I should have looked closer. Disregard my question earlier about Agent Oso, I see the answer. That would be a cool list to have! Kenny- I love your list and all the info is fantastic! Is there any chance you could do a list of characters that are in the different parades. I think DD would be ok with just seeing some of the characters, but I can’t seem to find good info anywhere on who is in the parades. Is it too unpredictable to do? Katie, I can begin developing that for you. Might take me a week or two. WOO HOO! That does it for me. The three year old will be happy with this one and only Character meal than and I don’t need the dinning plan. I swear the last time I looked it didn’t say Jake but, as you stated it does now. Disney’s description isn’t correct, but that’s not uncommon. Enjoy your meal! It’s a fun experience with the dancing and singing. Looks like I will have to book H&V than. They still have June and Leo, right? Wish they would add Jack the pirate. Than that woul be all we would have to do. Hope that helps with your planning. So, let me clarify. Agent Oso can only be met at Hollywood and Vine? Yes, Agent Oso and June can only be met at Hollywood and Vine. They don’t host regular meets in parks. Hi, Kenny, this blog is so helpful, thank you! My son is a HUGE fan of Oso, Jake and especially Handy Manny. Is there any way to know when they’ll take the characters out of rotation at Hollywood and Vine? We’re not going until January. Thanks! At this point I’d plan for those characters to remain for a while. So none of the Little Einsteins are around anymore besides June and then just at Hollywood and Vine? I think when they make their decisions they should consider which shows are currently on heavy rotation on tv. That’s correct Little Einsteins no longer do scheduled meets in the park. Is it just the fab 5 that have new outfits at HS? Where can I find some pictures of them? All the characters that meet at the hat have special costumes except for Stitch and the Pooh characters. Thanks Kenny. Your blog is awesome! Awesome find! It’s usually just Pooh and Tigger. Were they in the toy shoppe or near the International Gateway? Master List == exactly what I was looking for! Great work Kenny! Gordon…you can also search for the character you’re looking for. I’ll need to learn a few things before I can update each park keep up with the master list too for scheduling :) Great to see you here my friend! Did I miss Captain Jack Sparrow on the wonderful character list you just posted? Marriann…Captain Jack is only avaialble at Mickey’s Very Merry Christmas Party (MVMCP link at the top). Perhaps I should add him and other party characters like the Seven Dwarves, Abu, Blue Genie, Country Bears, Wendy and the Various Princes to the list with MVMCP designation? Oh, shoot. :( I was really hoping to see him when we were there. But it’s in May, so I guess not this time. :( Thanks for the wonderful list though! If you are planning a Disney Cruise in the future, he still meets regularly there. Jack is available to see at the Pirate Tutorial, just doesn’t pose for photos or sign autographs. I have seen Captain Jack outside the Pirates of the Carib ride the last two times. May 2011 was the last time I was there tough. Jack has a show outside POTC, but doesn’t do meet and greets unfortunately.